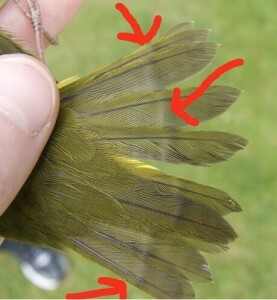 Stress bars are usually seen on the wings and tails of birds as thin, horizontal lines that go across the feather shaft. They can be caused by environmental factors, poor nutritional factors, medical issues or mental issues that are affecting the birds’ hormones during the time the feather is growing. So these stress bars actually reflect the bird’s healthy condition at the time of the feathers’ growth. Keep your eyes on the show up of the stress bars will help you take better care of your pet birds. 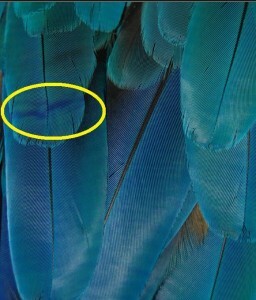 The additional vein marks on the feathers are called stress bars because they are caused by stressful events during the growth of the feathers. If the bars are at the end of the feathers and the other part of the feathers appear healthy, or new feathers have no stress bars, then the cause(s) of the stress have probably been eliminated. If feathers contain multiple stress bars, or new feathers still have stress bars, that mean the stressful event(s) are ongoing and we should pay more attention to find out if there are bad things happened to our birds and take steps to eliminate the cause(s) that are affecting the bird’s health.